You may not have known that George has been a regular writer for the Association of Professional Genealogists Quarterly since 2008 and was awarded their prestigious APGQ Excellence Award in 2013. 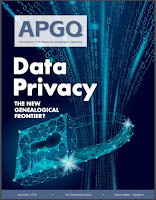 The APGQ is just one of the benefits of membership in the Association of Professional Genealogists. Membership is open to any person or institution willing to support the objectives and the APG Code of Ethics. George's latest article has just been published in the December 2018 issue of the e-magazine. It is titled "Add Visual Context to Your Genealogical Research" and discusses the collection, digitization, and addition of graphical materials to your work and that of clients for whom you perform research. He discusses original documents, personal identification documents, family photographs, stereographs, vintage postcards, newspapers, and more that add to the story. He discusses many places online to locate a wealth of images you may never have imagined. 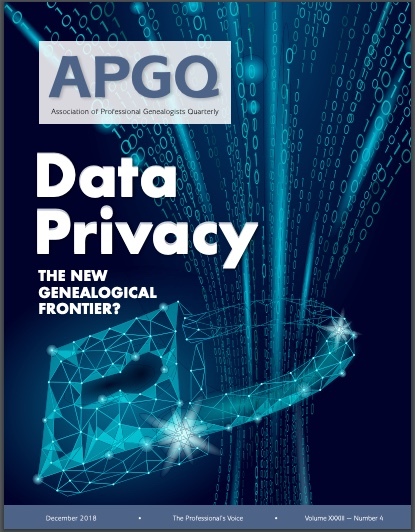 The APGQ is an outstanding quarterly publication that shares information for professional genealogists, people who want to enter the profession, and casual researchers as well. Learn more about the organization and membership at Association of Professional Genealogists. 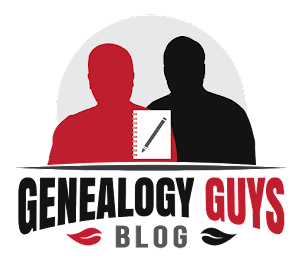 Why Would Someone Falsify Genealogical Data?